This is a commissioned still life painting. Very often I received emails from friends asking the price of a specific painting. And very often, I have to reply: I am sorry. The painting you are interested in has been sold. Now I have a new service for you - I take painting commissions. If you like a sold painting of mine, I can do another one using the similar composition. It will not be exactly the same as the previous one. Well it could be better because I am learning new stuff everyday. I did this painting from a photo Song took during our last year's China trip. In the first morning we stayed at the Xidi Village, I saw a group of ladies doing their laundry at a small pond. The scene was spectacular. It was incredibly beautiful. I like the good old days. The life was more painterly then what we have now. Some day I might paint people with smart phones. The China trip we have planned for this year did not make it. What a pity! We have postponed the same arrangement to 2017. Now we have much more time to think about it. If you are interested in join us in 2017, please contact Song to be on the list. Keep on going. Paint more figures. This one is my number 9 for this series. I have established my procedure. I am able to get a decent figure with adequate accuracy on proportion, anatomy, and perspective. I feel this is the first step, which is the study stage. Next, I will concentrate on the design to make the image more dynamic or dramatic. June is my studying month. You have seen I am working on my Impressionistic figurative paintings. I have been taking notes, documenting my trials and errors, summarizing my learning, and figuring out methods and procedures. Soon, I will involve my new knowledges in my workshop teaching and share them with all my students. Next month, I will teach 2 workshops. The first one will be at the Art School in Sandy Springs in Atlanta. It is full with a waiting list. 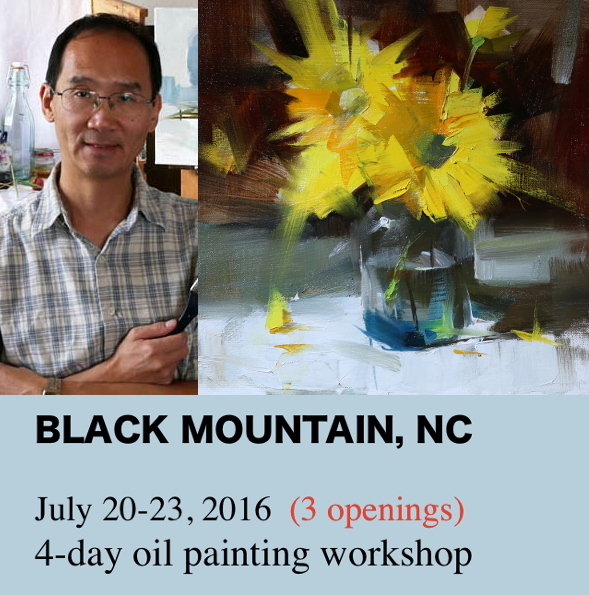 And then the second one will be at Swannanoa Valley Fine Art League in Black Mountain, NC. We still have 3 openings. If you are interested in my teaching, please contact Cheryl Keefer for information and signing up. I am looking forward to paint with you. My today's painting comes out smoothly. I have tried to keep the figure as loose as possible by avoiding unnecessary details. Painting children is rather pleasant. This young artist was observing what was happening right in front of him. He will be good at Plein Air very soon. I have followed the momentum of painting Impressionistic figures. This one is slightly easier than my previous one. I started to develop a procedure of this kind of work. It is rather different from my still life painting. When this procedure gets mature enough, I will share with you. Today, with my limited time, I did this abstract study. I started this one as a still life (you probably still can see it), but somehow I want to push it into a pure abstract direction. I have played with designs of geometry, color, value, and texture. To many representational, especially realistic painters, Going abstract is not easy. We are too used to following the visual world outside, but we don't know how to follow our internal world. Learning how to observe our subjective mind objectively will be very helpful to our art. There is freedom there, but we need to learn how to use it. I have spent more than a day on this painting. Boy! painting figure is hard. Especially the face and hands. They got to be absolutely correct. Artist's license will not work. This is my second drummer painting. When I posted my previous one, many friends did not know what the figure was doing. This one should be self-explanatory. I have gained more momentum in figurative painting. I did another one today. For figurative work, I feel it is rather difficult to compose. Different from a still life, in which I can easily move the objects, figure is difficult to move because there is too much involved. In addition, I have a hard time to maintain the size of the figure. It changes a lot when I try to get the proportion correct. To solve the problem, I have stopped using pre-sized panels and canvases. I tape a piece of loose canvas on a board, and figure out my composition by cropping the canvas after the painting is finished. The last Saturday in every April in Austin, you can find a hippy festival call the Eeyore's Birthday Celebration. People dress up and play drums all day long. This event is a wonderful photo opportunity. I took tons of photos. I know some of them will be great references for my figurative work. Today is a good day. Now I have more feeling about the Impressionistic color application. Painting figures is much harder than painting still lives. The proportion, anatomy, and perspective need to absolutely correct. Otherwise a three year old can tell you what is wrong with it. Sorry I have not been active in painting lately. I have run into some personal trouble, and have to deal with it alone. My mood now will be reflected by the Imagine Dragons's song "Demons". This is a beautiful painting. However, the beauty is hypocritical. Only the blue is the truth.